Can a flea market find inspire a whole room? It sure can! Continue reading to find out how I created a family-friendly living room that all started with this rug. My clients for this project are the sweetest family and were super fun to work with! The husband found this rug at a flea market in Atlanta shortly after college for less than $100! Yes, you read that right - less than $100! (It is a hand-knotted oriental wool rug. Rugs of this quality usually sell for a much higher price!) The rug has traveled with them from apartments, to condos, to houses, from Charleston, SC to Richmond, VA. It surely has witnessed many memories and has many stories to tell. It is truly a Story Piece, and I think with their updated living room, it will continue it's life with this family for many more years to come. When they first moved in to the house 4 years ago, we selected the paint color - Sherwin Williams Sleepy Blue 6225 - to coordinate perfectly with the rug. Using the rug as the inspiration piece and the blue walls as a backdrop, we moved forward with an 'updated, family-friendly room' as the end goal. They have two young daughters and needed a space that would endure sticky hands, but that would also feel grown-up enough to entertain and socialize with family and friends. They wanted to keep the sofa neutral, so we selected a grey sofa to anchor the room. We were able to find the perfect grey that has just the right amount of a blue undertone in order for it to tie into the rug and walls. The straight lines and tufted back cushions give the sofa a modern vibe. Once the sofa fabric was selected, we moved on to the other fabrics in the room. For truly personalized chairs and custom pillows, we selected a mix of geometric patterns - some with soft lines, and some more linear - that reflect the family's personalities. I love the shape of this arm chair - the curved arms, the deep seat, and the angular legs! It has a mid-century vibe to it, and the navy geometric print layered with the sunburst pillows are a perfect pair. We mixed and matched shapes and finishes for the side tables, coffee table, lamps, and other accessories in the room. The geometric detail on this chest not only adds detail to the chest itself, but it also gives a nod to the other geometric patterns in the room. The round coffee table, a round side table, and the round mirror above the mantel all help to soften the rectangular shape and other straight lines in the room. Gone are the days of having to use only one finish in a room (i.e. all brushed nickel). A variety of finishes adds depth and interest to any space. In this living room, we used a combination of gold (lamps and accessories), brass (mirror and window treatment hardware), and iron (legs of the coffee table and round side table, and accessories). 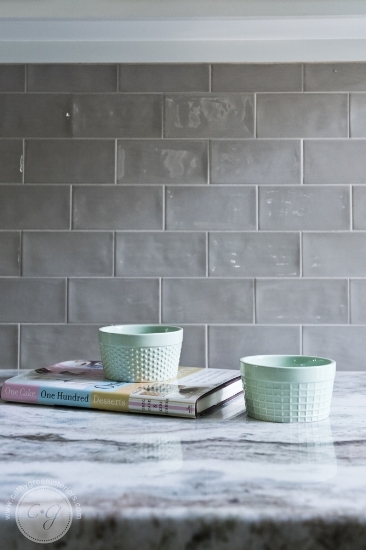 The mix of finishes keeps the eye moving and makes the room feel lived-in and approachable. In order to keep the room tied together and not have anything feel out of place, I made sure to use each finish more than once. I feel like I'm saving the best for last by giving you the close-up of the custom window treatments. 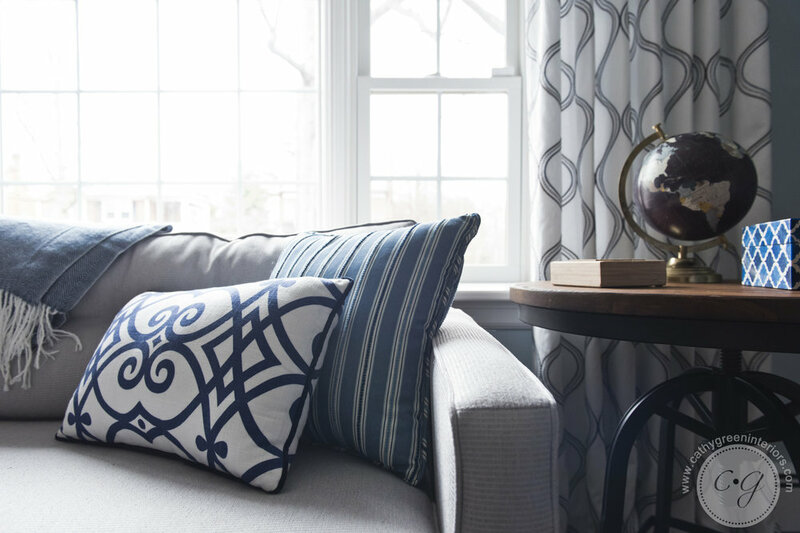 The soft navy and grey waves on the fabric are the perfect combination of white space, color, and pattern. And the hardware! - the vintage brass finish and the shape of the French pole are just.so.good. What a difference it made in the room when they were installed! These window treatments are one of the personalized elements of the room that make the space feel unique and custom. I love the way this living room turned out, and I'm so happy that my clients love it too! It is the first room one sees when walking into their home, and I was honored to deliver them a space that they are proud to share with their friends and family. 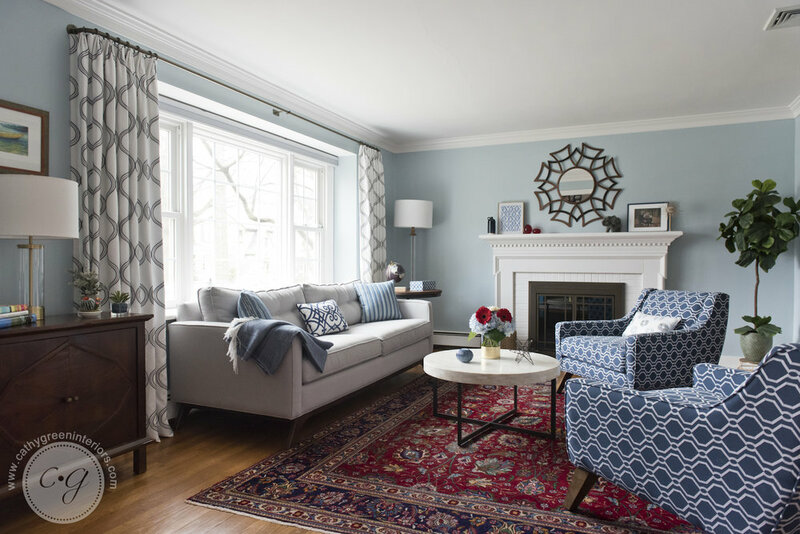 By using the existing rug and layering in a mix of patterns and finishes, this living room has become a functional, beautiful, and meaningful space that tells the story of this lovely family. It's been a long time since I've written a blog post! I can't wait to share my latest Client Reveal with you though ~ a builder-grade kitchen transformed into a beautiful and personalized space. The full reveal is coming soon, but here is a sneak peek! Last week, I shared a client's install with beautiful window treatments; today, I am sharing a second recent install - this time with more than just window treatments. This couple contacted me wanting to spruce up their neutral family room and unadorned foyer. We started with a new rug. We chose one that is still neutral, but that also brings in shades of blue and warm tans to relate to the wall color. After selecting the rug, we started to look at fabrics for new pillows and window treatments. We chose four fabrics that are a mix of fun, colorful patterns. We repeated one of the fabrics (the stripe on the right) to use as the window treatments. They have a lot of windows in the space, and we decided the best option for window treatments was to frame the French doors that open out to their deck. Adding window treatments to every window in the room would have overwhelmed the space. Here is a close-up of of the window treatment fabric - the blue and neutral stripes coordinate perfectly with the rug. They have satin nickel hardware throughout their kitchen and family room, so we repeated that with the drapery rod and finials. In their foyer, they needed a few pieces to add functionality and personality. She found a rug that she loved, and we used that as the inspiration for the space. Next, we added a bench and a shelf with hooks. To bring in more color to the space, we choose three blue fabrics for a bench cushion and pillows. Now, they have the perfect space for storing shoes, coats, and bags. I love mixing and matching patterns. It is also fun to see how new fabrics can completely transform a space! Hello and Happy 2015! The end of 2014 kept me busy with client work, and I had two big installs for clients last Friday. The first install I want to share is the home of a couple with two young boys. They are a busy family and recently completed a few renovation updates in their downstairs. They contacted me to help them with the 'finishing touches' of a few spaces. Clients frequently ask me, "Are custom window treatments worth it?" My answer is always: "Yes!" They make such a big impact in a room, and with the perfect fabric and beautiful hardware they are an investment clients are always happy they made. Here are the three rooms we worked on in their home to bring the perfect window treatments to the space. (Each room still needs a few pieces and accessories to finish it off, but the window treatments give them a good place to start and find inspiration). They had already selected transitional chairs (with a complementing sofa on the other side of the room), a geometric rug, and aqua and tan pillows throughout the room. The windows were just too bare, and they wanted a functional treatment to close for privacy. A fun, aqua and ivory 'wave' fabric compliments the other fabrics and patterns in the room. We also selected a sheer that can open and close to allow for privacy when needed. Satin nickel hardware coordinates with the hardware on their built-in bookcases. Either way, these window treatments help to complete the family room! The living room is "Mom's room" - a place to read, relax, and make phone calls to dear friends. She choose shades of teal and gray for the room, and she plans to bring in art work with greens and pinks. When we held up the fabric we selected for this room, we knew it was 'the one'. It has an updated-traditional feel to it, and the color palette matched perfectly with the space. We also selected satin nickel hardware in the living room to coordinate with the satin nickel nailhead trim on their gray leather wing chairs. Their dining room is a mix of traditional, family pieces, with more contemporary accent pieces. This gray and white floral fabric is the ideal balance of formal with a little bit of playfulness and youthfulness to complete the space. The black hardware coordinates with the chandelier and helps draw the eye up in the room. In these three spaces, the window treatments are beautiful highlights that help each room feel closer to being complete. Stayed tuned for the second install!